With the M-Track 8X4M, you can create 24-bit/192kHz studio-quality recordings with an intuitive and easy-to-use audio interface. This article walks through a number of frequently asked questions about the M-Track 8X4M. Does the M-Track 8X4M include any software? How do I connect the M-Track 8X4M to my computer? Do I need to use a power supply with the M-Track 8X4M? Do I need a driver to use the M-Track 8X4M? What audio sample rates does the M-Track 8X4M support? What types of devices can I connect to the combo XLR inputs? What types of devices can I connect to the Instrument inputs on the front of the M-Track 8X4M? How do I control the levels for Inputs 7 and 8? Can I monitor the direct input signal in stereo or mono? How do I use the Headphone Source Selector switches? How do I set up 2 different headphone mixes? How can I send MIDI data to and from my computer with the M-Track 8X4M? The M-Track 8X4M comes with a USB-C to USB-C cable as well as a USB-C to USB-A cable to ensure that it can connect to all current and future available USB connections. Yes, the M-Track 8X4M uses a 12V 2A center-positive power supply. For Mac operating systems, the M-Track 8X4M is class-compliant and does not require a driver installation. For a Windows operating system, the M-Track 8X4M requires the installation of a driver to ensure the best possible performance. You can obtain the Windows driver by visiting this link and choosing the M-Track 8X4M, or you can download the driver directly from your M-Audio account page. The M-Track’s Crystal Preamps and Pristine D/A converters capture every nuance and subtlety of your performance for truly professional recordings and crystal-clear monitoring. The combo XLR inputs will accept microphones and line-level devices (synth, drum machine, mixer, etc.). Use standard XLR cables for all microphones and 1/4” TRS cables for all line-level instruments. Adjust the input gain for each channel with the channel gain knobs. If you are using a microphone that requires phantom power to function, you can supply that power by toggling one or both phantom power switches. Inputs 1/2 use the first phantom power switch, inputs 3/4 use the second phantom power switch. Phantom power is only sent through the XLR port, not TRS. 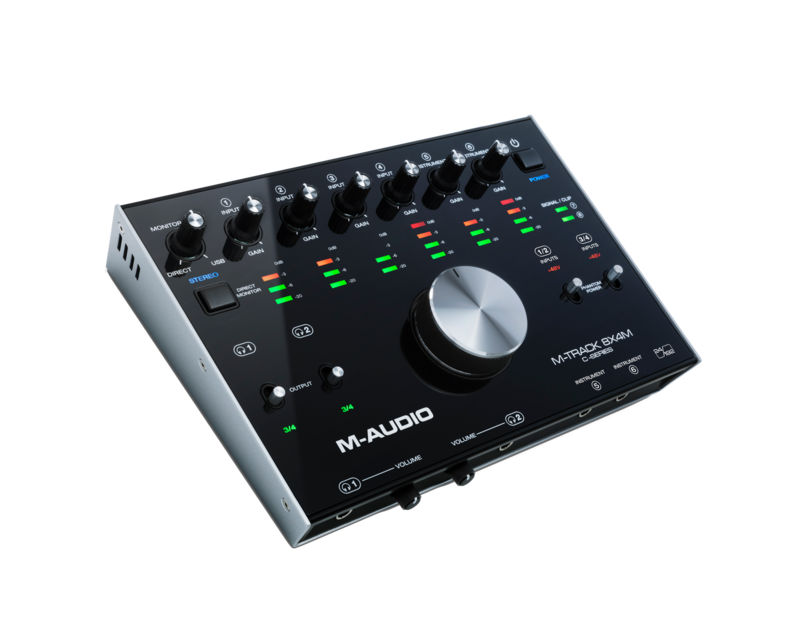 The M-Track’s inputs can be used in stereo pairs (Inputs 1/2 and 3/4) or as individual mono inputs (Inputs 1, 2, 3, and 4). You can choose the way in which the inputs behave in your DAW. Whether a signal is recorded or played back in stereo is dependent on your DAW. If you are using a guitar or bass with an active pickup, you could use the line-level TRS input as an alternative to instrument inputs 5 and 6. Connect guitars or bass guitars with passive pickups to the Instrument inputs. Use standard 1/4" TS cables to connect a guitar or bass guitar to these inputs. Adjust the input gain for each channel with the channel gain knobs. While these inputs can accept a signal from most active pickups, inputs 1-4 can also be used as a direct input for a bass or guitar with hotter active pickups. Inputs 7 and 8 are line-level inputs to which you can connect a mixer or other line-level devices. The level going into these inputs will be controlled from the source (the master output level on a mixer for example). The Signal/Clip LEDs on the front will indicate if the signal is being received and if it is too hot. Yes - whichever you prefer! The Direct Monitor switch can be used to toggle between stereo and mono monitoring. This is extremely useful if you want to monitor the incoming signal of a stereo source like the stereo output from a keyboard, or a mono signal from a guitar. When in the raised position (indicated by a blue Stereo LED), Inputs 1, 3, 5, and 7 will be monitored in the left channel and Inputs 2, 4, 6, and 8 will be monitored in the right channel. When in the depressed position, (indicated by a green Mono LED), all inputs will be summed into mono and heard equally on both channels. This switch does not affect how audio is recorded into your DAW; it affects only how you hear the input signal in the Headphone Outputs (when the Headphone Source Selector is set to 1/2, and the Monitor Mix knob is set to anything besides USB) and Monitor Outputs. These two switches select which outputs on the M-Track 8X4M’s rear panel are also sent to the headphone outputs. As each of the headphone outputs can be assigned to different main outputs, split headphone mixes are just a flick of a switch away! Your main mix will always use output channels 1 and 2. Your sub mix will use the M-Track 8X4M’s output channels 3 and 4. To create a sub-mix, add a send that’s sent to M-Track 8X4M’s output channels 3 and 4 to every track you would like to send to your sub mix. You can then adjust the level of each track’s signal being sent to this bus by moving the channels send level up and down. Use the included 1/8" TRS to MIDI DIN adapters to connect standard 5-pin MIDI DIN cables to your M-Track and external MIDI devices. Select the M-Track 8X4M in your DAW as a MIDI I/O device to send and receive MIDI data from outboard gear.